Horse Pedestal for sale with free 48 state shipping! 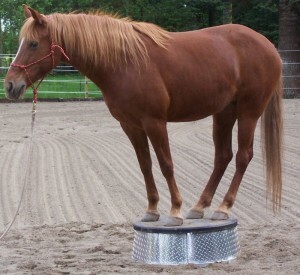 Please note this Natural Horsemanship Pedestal is currently available with a rubber mat top. The bonded top coating shown in the picture is no longer available. All aluminum construction for light weight,durabliity and NO RUST EVER! Just because it’s functional doesn’t mean it can’t look good at the same time so we used Diamond Plate for the sides. Extra tall at 12″, top diameter is 32″ with a 35″ base for stability. Weighs just 45 lbs so it is easy to carry or roll around. Shipping on this pedestal is included in the price for any location in the 48 states. 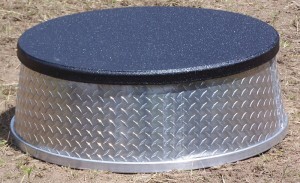 If you need a pedestal shipped to another location please contact us for a shipping quote.